Join breast cancer survivors, their families, those currently battling the disease, and anyone who wishes to walk and show their support. It will be a fun-filled morning of fellowship, activities for children, music, dance, exercise and parkour demonstrations, and more. This year, we are encouraging people to form teams to walk together and to raise funds as either individuals or teams to support our efforts. Please consider reaching out to your friends and family. Utilize the social media features when you register. Let's make a difference. Visit our website to learn more about the charitable work of the National Breast Center Foundation. The top fundraising team along with the top individual fundraiser will be invited to carry the banner and lead the walk with Dr. David Weintritt, Founder of the National Breast Center Foundation. WHERE: Fort Hunt Park Alexandria, Virginia. We Offer Sponsor Level Giving. The list below explains the levels and what your contribution can do to make a difference. $10,000: Presenting Sponsor – Furthers all aspects of the NBCF’s mission of education, outreach and technology to help women in need. Receives the highest level of sponsorship recognition. Your logo/name on t-shirt and all print and social media, including walk website, podium recognition, and opportunity to speak at walk to approximately 500 attendees. Presenting sponsor is welcome to provide promotional materials in walker registration and have a featured display table at the event. Includes registration for team of 20 walkers. $5000: Title Sponsor -- Provides office visits, ultrasounds, or biopsies for low income and uninsured/underinsured women. Sponsor logo/name prominently displayed on t-shirt, signage at event and all print and social media, including website, and podium recognition. Title sponsor is welcome to provide promotional materials in walker registration and have a display table at the event. Includes registration for team of 10 walkers. $2500: Platinum Sponsor --Assists with breast cancer surgical costs and helps pave the path to a cure. Sponsor logo/name on t-shirt, signage at event and all print and social media, including website, and podium recognition. Platinum sponsor is welcome to provide promotional materials in walker registration and have a display table at the event. Includes registration for team of 5 walkers. $1000: Gold Sponsor – Helps cover cost of testing procedures, equipment needed and pathology. Sponsor logo/name on t-shirt, signage at event and all print and social media, including website, and podium recognition. Gold sponsor welcome to provide promotional materials in walker registration and have a display table at the event. Includes registration for 2 walkers. $500: Silver Sponsor—Provides whole breast ultrasound screening, digital mammogram or genetic testing for several women. Sponsor name on t-shirt at silver level, signage at event and all print and social media, including website. $250: Bronze Sponsor -- Helps with educational and outreach materials to reach more women in need. Sponsor name on website and signage at event. TO SPONSOR THE WALK, PLEASE CLICK ON APPROPRIATE SPONSORSHIP LEVEL ON REGISTRATION PAGE. 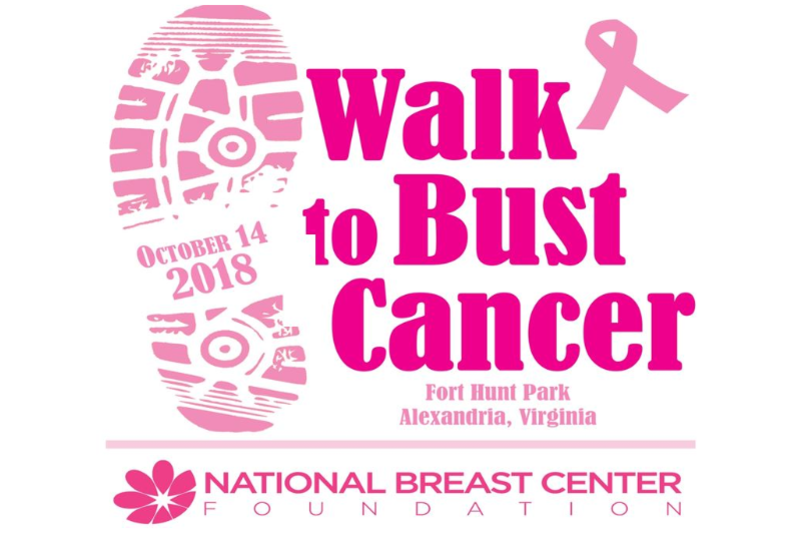 Please take a few moments to view our video about one of the families who has personally benefited from the National Breast Center Foundation efforts and see what a great community day the WALK TO BUST CANCER creates. Come out and join us!